Online Exhibition Of Paintings By Ananda Kishore Singha is an event that took place between 25-Mar-2007 and 14-Apr-2007 in Hyderabad. The Buddha constantly preached of the unreality of this world. He would then certainly approve of this exhibition involving him, which is literally unreal. For the convenience of its guests, clients and well-wishers this scorching summer, Daira is hosting a web show starting 25th March to 14th April at dairagallery.net. Art-lovers can browse through the paintings, and select any of them, online, in the comfort of their homes. Alternatively, the paintings can also be viewed at Daira - Centre For Art And Culture, on request. 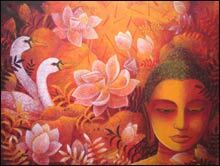 The exhibition is titled Flaming Garden Of Serenity, and is based on the romantic life of Lord Buddha. For Ananda Kishore Singha, life is an enormous reference book from which he keeps selecting and deleting objects to compose his visual frames. Like the rights and wrongs of life, the artist makes decisions to arrive at a personal visual ideology. Passion, serenity, beauty and love are the elements with which he prunes his Flaming Garden of Serenity. Therefore, the serene Buddha and the seductive Princess keep recurring as characters who define the choices and emotions of the artist. On a blazing red background, surrounding the Buddha and the Princess, the lotus and the leaf are adopted as a decorative form which enhances the energy of the color red. A selective palette of red, white, yellow and black becomes the surface or the hue of the garden the artist is motivated to paint. Born and brought up in Silchar, Assam, Ananda Kishore Singha completed his Bachelors of Visual Arts in 1996, and his Masters of Visual Arts from the Rabindra Bharati University, Kolkata, in 1999. He was a gold medalist, and a recipient of the National Scholarship during 1996-98 and the Assam Government Scholarship during 1992–96. He participated in a number of group shows. This is his premier solo exhibition at Daira. For further details, please contact the art gallery at 6661-8628/98499-87187. Be the first to comment on Online Exhibition Of Paintings By Ananda Kishore Singha! Just use the simple form below. fullhyd.com has 700,000+ monthly visits. Tell Hyderabad what you feel about Online Exhibition Of Paintings By Ananda Kishore Singha!